Gen. Michael V. Hayden (USAF, ret. ), former director of the CIA (standing), with Christof Heyns, UN Special Rapporteur (left), and David Cortright (right), director of policy studies at the Kroc Institute. The conference began with remarks by Gen. Michael Hayden (U.S. Air Force ret. ), former director of the CIA. Hayden presented the military case for drone strikes, arguing that they are legal under the 2001 Authorization to Use Military Force and effective as a means of eliminating targeted Al Qaeda leaders. Drones nonetheless have produced blowback effects, he said, and have strained alliance relationships with some countries. Gen. James Cartwright (U.S. Marine Corps ret. ), former Vice Chairman of the Joint Chiefs of Staff and former Commander of U.S. Strategic Command, raised similar concerns on the second day of the conference, questioning whether the costs of the program may be exceeding its benefits. These ‘second and third order effects,’ as Hayden called them, may signal that the time has come to begin dialing back the program. Christof Heyns, the UN Special Rapporteur on summary, extrajudicial or arbitrary executions, emphasized that the right to life is supreme under international law and that life cannot be taken except under strictly limited and narrowly prescribed circumstances. He expressed concerns that unrestricted drone warfare may be eroding international legal standards and weakening global security. Drone technology is at an early stage of evolution and will inevitably spread to other nations and to non-state actors as well, he said. The UN has an essential role to play in emphasizing the global interest in establishing common principles for when and how drone technologies can be utilized for military purposes. Standards of transparency and accountability must be established within the framework of international law. The conference took place in the context of recent changes in the Obama administration’s drone program. The number of strikes in Pakistan has declined in recent months. U.S. officials claim that Pakistani officials approve the continuing strikes, but the elected government in Karachi has repeatedly called for drone strikes to end. The Obama administration is reportedly planning to place drone strikes under military command and to scale back the CIA role in drone attacks. Conference participants noted, however, that the CIA will continue to play an active role as long as strikes continue in Pakistan, where direct U.S. military involvement is impermissible. Drone strikes also are continuing in Yemen, and pressures may grow to extend the use of these weapons to Mali and the Western Sahel. 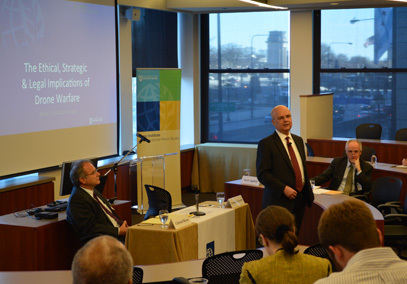 Evolving political and security conditions will shape the future of drone warfare. In the United States legal challenges by the ACLU, the Center on Constitutional Rights, and other groups are contesting the administration’s refusal to release documents and are beginning to chip away at the government’s wall of secrecy surrounding the drone program. Bipartisan calls are emerging in the U.S. Senate for greater transparency and the disclosure of policy documents. Conditions are also changing at the international level. Al Qaeda has diminished greatly in recent years and reportedly numbers fewer than 100 militants in the Afghanistan/Pakistan border area. Al Qaeda is incapable of mounting major strikes as it did on 9/11, panelists argued, and the organization has almost zero operational capacity. Affiliated groups such as Al Qaeda in the Arabian Peninsula (AQIP) and Al Qaeda in the Islamic Maghreb (AQIM) have emerged, but these movements are mostly focused on local concerns and pose less of a threat to Europe and the U.S. homeland. Affiliate groups may adopt Al Qaeda as a flag of convenience to aid local fundraising and recruitment, but they have little or no organic connection with the leaders who planned and carried out the 9/11 terrorist attacks. The negative consequences of drone warfare are becoming increasingly obvious. General Stanley McChrystal (U.S. Army ret. ), former commander of U.S. forces in Afghanistan, said recently that drone strikes are creating increased resentment and animosity toward the United States. This has contributed to the metastasizing of violent extremism and the continuous flow of recruits to jihadi militant groups. U.S. drone strikes are deeply unpopular in many major Muslim-majority countries and also in some allied countries in Europe. President Obama sought to restore America’s global reputation when he ended U.S. military involvement in Iraq, but his administration’s expansion of drone warfare has diminished much of the goodwill the President attempted to create.